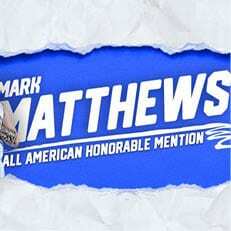 ALBANY, N.Y. – Following an exemplary 2018-19 season in which he helped lead Nova Southeastern to its first-ever Elite Eight appearance, redshirt junior Mark Matthews has been named to the Division II Conference Commissioners Association (D2CCA) Men’s Basketball All-America Honorable Mention Team. The All-America honor is the second-ever by a Sharks player, and first since the program joined the NCAA back in 2002. 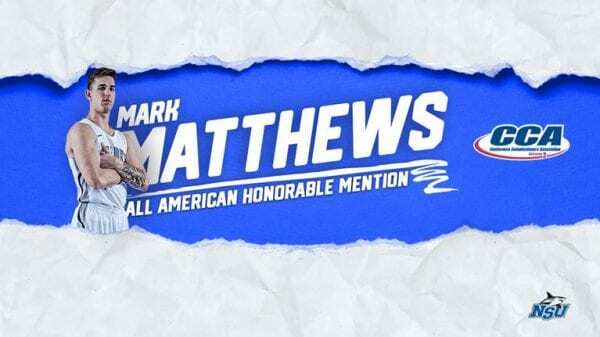 The team leader in both points (20.6 ppg) and rebounds (9.6 rpg), Matthews proved to be a double-double machine in his first year with the Sharks, recording an impressive 16 in his 33 starts. The Bonita Springs, Fla. native shined on the biggest stages, carrying Nova Southeastern with some notable performances in the postseason. After pouring in a season-high 32 points in the NCAA South Region Semifinal victory over West Alabama, Matthews tallied 18 points and 11 boards in the Sharks’ regional title win against rival Lynn. He then added 31 points and 13 boards in the Elite Eight against a Saint Anselm club that led its league in field goal percentage defense. Matthews’ latest accolade comes on the heels of already being named to the NABC All-District First Team, D2CCA First Team All-South Region, as well as being selected as the Sunshine State Conference Newcomer of the Year. Matthews scored in double-figures in all but one contest, and has set numerous single-season, NCAA-era program records for the Sharks this season, including points (680), field goals (290), total rebounds (316), and offensive rebounds (151). A complete list of the D2CCA All-America teams is available here (PDF). 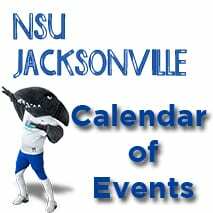 To stay up-to-date with the Sharks, follow them on Twitter at @NSU_MBasketball.